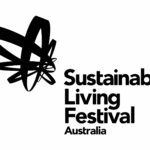 As part of the National Sustainable Living Festival 2019, the last — and potentially best! — of 30 events in 14 countries comes the Melbourne launch of Housing for Degrowth: Principles, Models, Challenges and Opportunities, at RMIT University in Building 80 (aka Swanston Academic Building) at 445 Swanston St Melbourne on Level 2 in Lecture Theatre Room 7 at 5.30 – 7pm on Thursday 21 January. What are the housing alternatives of the future? 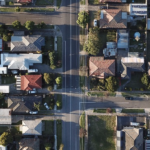 Join this Cohousing Australia event — at 6–8pm at the Presidents Room at the Kelvin Club 14–30 Melbourne Place, Melbourne — to find out about cohousing and why everyone is talking about it. This is an exciting opportunity to learn the value of community living and resource sharing. Find out how cohousing and alternative ownership models can lift community engagement and build a more sustainable future. Learn about the potential of Community Land Trusts to deliver perpetually affordable housing. Ask your burning questions to the panel of speakers: Anitra Nelson, Heidi Lee, and Karl Fitzgerald with MC Elsie L’Huillier of Commoners Coop. Find out more here. 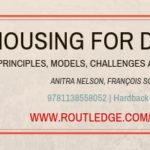 As co-editors of Housing for Degrowth: Principles, Models, Challenges and Opportunities, from 27 October to 4 December, I and François Schneider will speak with other urbanists and contributors to the book at more than 25 events and workshops in cities in 11 European countries. A working schedule of the tour can be found here. Details for just some of these events appear below. On Monday 3 December, I spoke on Housing for Degrowth and allied themes in Small is Necessary in a Multidisciplinary Seminar of architects and engineers, humanities and social science students organised by the Rachel Carson Center for Environment and Society and their colleagues at the Technical University of Munich. 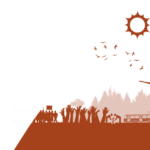 On Tuesday 4 December, I spoke in the late afternoon on Housing for Degrowth Tuesday Discussion series (16:15–17:15) for writing fellows and students at the Rachel Carson Center at the Ludwig Maximilien University in Munich. On Saturday 10 November at 6pm (TBC), François Schneider and I spoke as co-editors of Housing for Degrowth: Principles, Models, Challenges and Opportunities and discussed degrowth more generally at the event ‘Podrast Odrasti’ in the Atrium at ZRC SAZU, Research Centre of the Slovenian Academy of Sciences and Arts, Novi trg 2, 1000 Ljubljana, the capital of Slovenia. The meeting and workshop ‘Housing for Degrowth — A Different plan for Urbanisaton‘ took place on Sunday 4 November at 5–7.30pm at Cafe Kryzys: ul. Wilcza 30, 00-544 Warsaw. The authors of Housing for Degrowth discussed degrowth in practice, problems of contemporary housing and emerging ideas for the future. The future is now! More details appeared at the Facebook event page here. This Housing for Degrowth event on Friday 2 November from 7–9 pm was one in a series of id22 2018 ExperimentDays where we talked about eco-collaborative housing and degrowth. 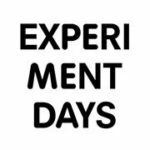 ExperimentDays annually showcase CoHousing and CoLiving and this event was held at RAW-Friedrichshain, Warschauer Brücke / Revaler Str. in Berlin. They had to stop participants after 135 were fitted into a venue generally catering for a maximum of 90! On Thursday 1 November at 7.30pm the ‘Zurück zur Zukunft – Degrowth und das Recht auf Stadt’ event included chapter contributor Lina Hurlin (Mietshäuser Syndikat) and me as co-editor — speaking on Housing for Degrowth and discussing degrowth more generally at Pögehaus, Hedwigstraße 20, Leipzig-Neustadt. The event was ably facilitated by Nina Treu, also the event contact (n.treu(at)knoe.org). The Wuppertal Institut für Klima, Umwelt, Energie gGmbH — Döppersberg 19 D-42103 Wuppertal — hosted an event with François Schneider and myself speaking as co-editors of Housing for Degrowth: Principles, Models, Challenges and Opportunities and discussing degrowth more generally. The event took place at 17:00 on Tuesday 30 October. At the Faculty of Architecture, Delft University of Technology (TU Delft), at 19:00 Monday 29 October, I and François Schneider spoke together on the book that we co-edited and the work of its 25 contributors — Housing for Degrowth: Principles, Models, Challenges and Opportunities. Casseurs de pub — producers of the journal La Décroissance — hosted an event with François Schneider where we spoke as co-editors of Housing for Degrowth: Principles, Models, Challenges and Opportunities and discussing degrowth more generally at 17:00 on Saturday 27 October. 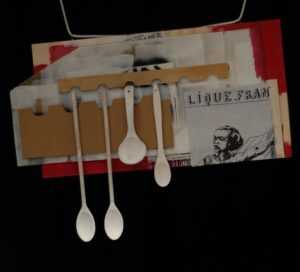 This public event took place at 52 Rue Crillon, 69006 Lyon mainly presented in French. 17 September François Schneider and I presented a paper on housing for degrowth at a postgrowth preparatory seminar at Université Libre de Bruxelles in Brussels preceding the 18–19 September Post-Growth Conference and arranged by members of the European Parliament from different political groups, various academics, NGOs and unions, which took place in premises of the European Parliament. The aim was to influence the next European elections and the nomination of a new Commission so future policy focuses on measures to ensure genuine sustainability. 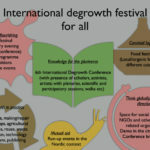 The 6th International Degrowth Conference took place in venues in and around Folkets Park, Malmö (Sweden), 21–25 August. 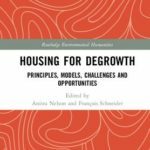 On 23 August, 16:00-17:00 we co-editors presented and launched Housing for Degrowth: Principles, Models, Challenges and Opportunities — joined by contributors Jin Xue, Natasha Verco, Pernilla Hagbert and Karl Krähmer who talked about their chapters. An outcome of the 5th International Degrowth Conference in Budapest our book with 25 contributors is now out in the Routledge Environmental Humanities series and we will have paperback for sale at a special price of 25 Euros — contact me through this site or using my RMIT email address. A guest lecture on Radical Landscape Architecture referencing Mike Davis’s classic Ecology of Fear at 11am–noon, Thursday 16 August, at RMIT University Design Hub. Invited by landscape architecture lecturer Alban Mannisi. Great discussion with landscape architecture students and lecturers afterwards. Talk on Small is Necessary at 11.30am at a one-day workshop Creating Self-Managing Communities organised by Cohousing Australia. Venue: Dream Factory at 90 Maribynong Road, Footscray. 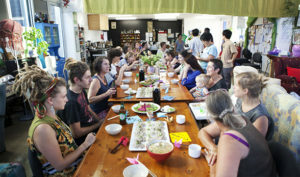 Different presentations, facilitated by Cohousing Australia, demystified concepts and participants worked through key questions associated with the process of creating a citizen-led, cohousing and/or self-managing community. Can we make housing more affordable through design? 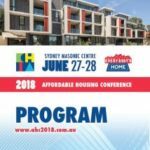 panel 2–3.15pm at the Everybody’s Home 2018 Affordable Housing Conference at the Sydney Masonic Centre organised by Community Housing Industry Associations NSW and Homelessness NSW. I talked about the affordability of eco-collaborative housing alongside Chris Johnson (CEO, Urban Taskforce), Francesca Muskovic (Policy Manager—Sustainability and Regulatory Affairs, Property Council of Australia) and John Brogden (CEO, Landcom). Small is Necessary book event organised by Castlemaine Library at the Phee Broadway Theatre, Mechanics Lane. Does small mean less? More than 150 people came to hear Anitra Nelson speak about different strategies for shared, eco-friendly living around the world. I discussed the positive social and economic benefits of small, co-operative living with another local, Mary-Faeth Chenery, who is a member of a group establishing a cohousing project in central Victoria, WinC — Older Women in Cohousing. 5.30–6.30pm. Free. 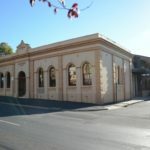 A Localising Leanganook community conversation — at 5pm on Sunday 17 June at the Ray Bradfield Room adjacent to Victory Park in Castlemaine — where I asked: Are housing for ‘degrowth’ and ‘eco-collaborative’ housing ways of the future? With reference to both Small is Necessary: Shared Living on a Shared Planet and the soon to be published collection that I co-edited with Francois Schneider, Housing for Degrowth: Principles, Models, Challenges and Opportunities, I discussed aspects of degrowth, housing for degrowth and eco-collaborative housing as ways of achieving more affordable, sustainable and community-based living. Eco-Suburbia: Low Carbon Futures What will a future Melbourne look like? Panel session with renowned environmental designer and permaculture co-originator David Holmgren (RetroSuburbia), Professor Ralph Horne (Housing Sustainability in Low Carbon Cities) and Associate Professor Anitra Nelson (Small is Necessary: Shared Living on a Shared Planet) — chaired by Emeritus Professor Mike Berry — from the RMIT Centre for Urban Research. We discussed models and current policy and planning debates on Melbourne’s future. 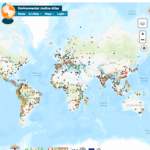 I was in conversation with a member of Dancing Rabbit Ecovillage, Rae Machado, on ways that living together can make us environmentally sustainable by reducing our ecological footprint. This Thursday 7.30pm event was hosted by the Everything Goes Book-Cafe at 208 Bay St not far from the ferry stop on Staten Island. See more at the events pages of the EGBC site and at Pluto Press. At, and hosted by, the Museum of Reclaimed Urban Space 155 Avenue C at 4–5.30pm, I talked referred to case studies of eco-collaborative housing involving radical sharing households, squats and communes associated with Small is Necessary: Shared Living on a Shared Planet. The discussion was great and books sold at a discount (US$20). At the full room on Sunday at the 11.30am session on Socialist and Anarchist Utopias at The Great Transition: Preparing a World Beyond Capitalism international conference, 17–20 May, in Montreal (Canada), I and Terry Leahy presented papers on non-market socialism: ‘Socialism where people and planet, not money, are central’ and ‘How to save the environment “without planning”‘, respectively. Download NMS-Montreal-Final We wre rapt with the response and discussion afterwards, including over lunch. The conference offered an opportunity to promote the emergent Palgrave Macmillan Alternatives and Futures: Cultures, Practices, Activism and Utopias book series of which I am the series editor. I am seeking proposals, see Alternatives&FuturesFlyerB&W. 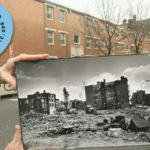 Eco-collaborative housing; eco-collaborative futures? A talk for the Department of Geography at the University of Sheffield 4pm Tuesday. 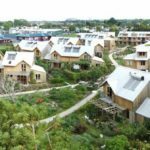 Affordable, sustainable, community-based and neighbourhood oriented housing seems the way of the future — might not ‘alternative’ housing — specifically eco-collaborative housing, become mainstream? This talk analysed possible futures for such housing driven, alternatively, by government policies, ecohousing entrepreneurs, and/or resident-driven models eschewing both the state and the market. The London launch of Small Is Necessary: Shared Living on a Shared Planet took place at Housmans Bookshop 7pm 4 May. I went into conversation with Victoria and Albert Museum Curator of Contemporary Architecture and Urbanism Rory Hyde. Housmans is at 5 Caledonian Road, Kings Cross, London, a two minute walk from King’s Cross/St.Pancras terminals, at the bottom end of Caledonian Road where it meets with Pentonville Road. Phone 020 7837 4473 for more details. More at the publisher’s site here. Noon talk on Small Is Necessary: Shared Living on a Shared Planet at Southern Gippsland Sustainable Living Festival, Wonthaggi. Signed books available at discount. 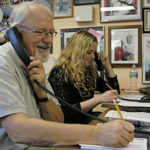 Interviewed, 2 March, by Esty Dinur for WORT FM community radio Madison (Wisconsin) on Small Is Necessary: Shared Living on a Shared Planet. See item and listen to podcast here. 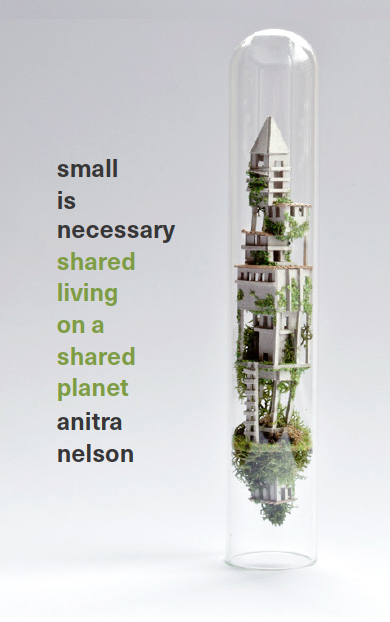 A conversation between Anitra and Giselle Wilkinson on Small Is Necessary: Shared Living on a Shared Planet at New International Bookshop (54 Victoria Street Carlton) on Thursday 1 March 7pm. Dynamic Giselle is a sustainability and eco-collaborative housing expert who co-founded the National Sustainable Living Festival and Murundaka. On the Tuesday 27 February, the University of Melbourne’s Melbourne Sustainable Society Institute Political Economy Reading Group met through lunch to hear a short talk by Anitra and to discuss a reading of Chapter 9 of Small Is Necessary: Shared Living on a Shared Planet. 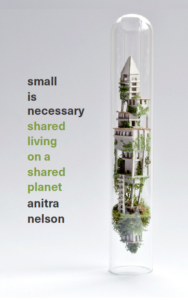 Melbourne launch of Small Is Necessary: Shared Living on a Shared Planet at Readings Carlton bookstore (309 Lygon Street) 6.30–7.30pm 22 February 2018. Eco-polis urbanist Paul Downton — cofounder of urban cohousing project Christie Walk in Adelaide — launched the book. I gave a talk of gratitude to multiple people and referred to benefiting from a Carson Writing Fellowship (2016–2017) at the Rachel Carson Center for Environment and Society at LMU in Munich. Professor Jago Dodson, director of the Center for Urban Research at RMIT University was MC. Buy paperback for $42.95 online or in Readings shops. Event, wine and author’s signature all free. An event of the National Sustainable Living Festival 2018. Paper ‘The Political Economy of Space and Time in Eduardo Galeano’ presented at the 2018 Australian International Political Economy Network (AIPEN) conference, 8–9 February, hosted by the School of Social Sciences at the Monash University Caufield campus. 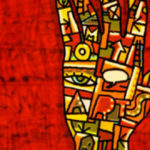 Economic Populism in a Globalised World is the title of the conference. The paper was in Panel 3 ‘Space of Dispossession, Populism and Anti-Politics’ held between 1.30 and 3.00pm on Thursday 8 February. Other contributors to the same panel were Adam David Morton, Elizabeth Humphrys and Tom Chodor. 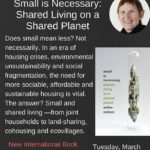 Interviewed by Hear Say program presenter Suzanne Donisthorpe about Small Is Necessary: Shared Living on a Shared Planet at around 10am on Tuesday 6 February 2018. Hear Say is a popular regional news and views program for the area where I live, Castlemaine, in Central Victoria Australia. Rehearsed reading of play Servant of the Revolution by Red Room Theatre actors in the Law Lounge, Level 1 of the New Law Building, University of Sydney. Time (arrive 5-10 mins early): 11.45am–1.15pm Thursday 7 December. An event of the Capital and the Revolt Against Capitalism Historical Materialism Sydney conference, University of Sydney, 7–8 December. It was free and included a short introduction and discussion as time allowed. 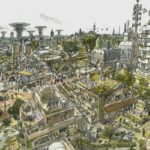 ‘An ecosocialist answer to the housing question’ talk at the Capital and the Revolt Against Capitalism Historical Materialism Sydney conference, University of Sydney, 7–8 December in the Housing Rent and the Politics of Space session (with Adam Morton and Joe Collins) on Thursday 7 December, 2.30pm–4pm. 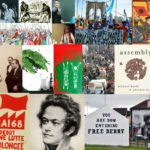 I outlined ecosocialist principles for, and ideal types of, housing and various anti-capitalist strategies for achieving them by drawing on cases and arguments in forthcoming books Small is Necessary and Housing for Degrowth. Then I joined Ariel Salleh, Adam Morton and James Goodman in a reflective conversation to launch the 20th anniversary edition of Salleh’s Ecofeminism as Politics: Nature, Marx and the Postmodern between 3.45 and 5.15pm on the Friday 8 December afternoon. In conversation with UK author, playwright, filmmaker, journalist, political commentator and broadcaster Bea Campbell, and historians Stuart Macintyre and Peter Love for the Now What? — 100 Years After the Russian Revolution seminar, South Melbourne, Saturday 11 November 2–5pm. The lively discussion engaging all participants in the seminar included responses to questions, such as, What are the lessons of 2017 for contemporary politics? What does ‘socialism’ mean to today’s resurgent and young socialists? 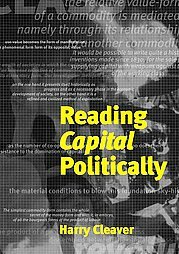 Invited speaker — in conversation session with key note speaker Emeritus Professor Harry Cleaver at the Karl Marx’s Critique of Political Economy and the Global Crisis Today conference, Hofstra University Cultural Centre, Long Island, New York, 6–7 April 2017. This Money, Transition and Post-Capitalism session focused on moving beyond money as a necessary step to moving beyond capitalism — following arguments in my CNS ‘Your money or your life’ article. 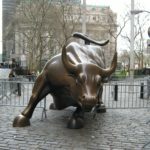 Noting the neglect of this topic in the Left broadly, we urged both a wide-ranging discourse and greater analytical clarity about a transition beyond money as integral to the transcendence of capitalism. Lunchtime Colloquium speaker, Rachel Carson Centre for Environment and Society (RCC) at the Ludwig Maximilian University of Munich at noon on Thursday 15 December, 2016. I talked to my book project as a three-month Carson Fellow (Prof. Dr) writing at the centre — 30 October 2016–30 January 2017 — in order to complete the penultimate draft of Small is Necessary: Shared Living on a Shared Planet. Find the YouTube video here and a one-pager on my project at the RCC here. 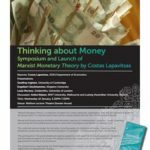 Invited discussant for the Thinking about Money symposium and launch of Costas Lapavitsas’ Marxist Monetary Theory collection of papers published by Brill — Wednesday 18 January, 5.30–8pm, SOAS, University of London, London. For a record of proceedings — a talk by Costas Lapavitsas and commentaries by Louis Moreno (Goldsmiths, University of London), Geoffrey Ingham (University of Cambridge), and Engelbert Stockhammer (Kingston University) — see SOAS Department of Economics, SOAS Economics Podcasts ‘Thinking About Money Parts I–III’. Presented paper in the Moving Beyond Capitalism stream of the IIPPE 7th Annual Conference in Political Economy ‘Political Economy: International Trends and National Differences’, School of Economics and Management, University of Lisbon, 7–9 September 2016. 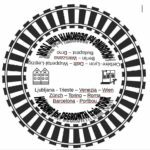 Coordinated a Housing for Degrowth Session and contributed two papers to the 5th International Degrowth Conference, Corvinus University, Budapest, 30 August–3 September 2016. 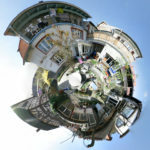 The session led to our Housing for Degrowth book project. 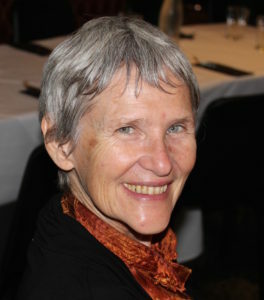 Keynote speaker at the Food, Pay, Love event — workshops on independent, sustainable living for women — organised by Women’s Health in the North, held at SPAN Community House, Thornbury, 31 May 2015. Invited Speaker for panel session 'Future Economy: Climate catastrophe, back to basics, or automated luxury?' at the Greens NSW Reboot (ideas) conference 31 October 2015. Life without money. Guest lecture, 3rd Summer School on Environmental Conflicts and Justice Summer School ICTA UAB Barcelona, 11 July 2012. 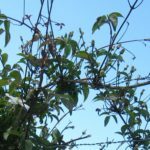 Degrowth and Money: Future Scenarios. Led a three-hour symposium held 16 May at the International Conference on Degrowth in the Americas, Montreal (Quebec) 13–19 May 2012. With Terry Leahy and Ariel Salleh ‘Life Without Money: Building Fair and Sustainable Economies’ (book) workshop. 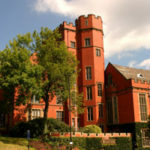 The Australian Sociological Association conference, University of Newcastle, 28 November–1 December, 2011.